3-room apartment 70 m2, on the ground floor (with an elevated position of the chalet 20 steps to the front door), renovated in 2008, all hardwood floors, new bathroom 2010, nice and modern furnishings, living / dining room with cable-TV, video and Radio. Exit to the patio. 1 sleeping room with 1 double. Bed (160 cm) cable TV and fitted wardrobes. 1Schlaf- room with 2 single beds put together, cable TV and fitted wardrobes. Open kitchen (4 ceramic hotplates, Bachofen, dishwasher, fitted wardrobes, fully equipped with dishes, glasses, Fondue Chinoise and set, raclette oven, pans etc.). Shower / WC new and modern. Patio 40 m2, granite table with 6 chairs, 2 sun loungers, parasol and barbecue. Very nice panoramic view of the mountains and glaciers. Internet connection. Please note: Non smoking property, no pets. Cozy bathroom, shower with rainforest showerhead from above and normal hand shower, toilet, large mirror cabinets and sink. Die Wohnung ist super gut ausgestattet , wir haben sehr gut geschlafen. Es ist nicht weit zum Bahnhof man kann alles zu Fuß machen. 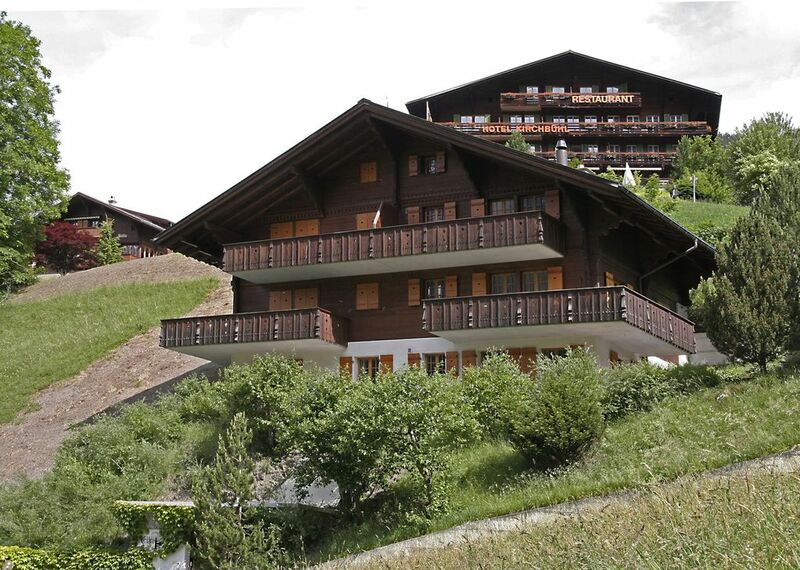 Well equipped and tidy apartment with lovely views in a quiet location in Grindelwald. Parking was very useful also. In a premium position, built in chalet-style nice, cozy small apartment house 'yew', in the district Guggen, central, quiet, sunny position, in a cul de sac, in the countryside, south facing, beautiful Glacier view. In the house: ski storage, central heating, laundry. Parking lot in garage. Grocers 50 m, supermarket 500 m, shopping center 400 m, restaurant 50 m, bar 200 m, ski bus stop 50 m, railway station Grindelwald village 600 m, swimming pool 2 km, indoor swimming pool 500 m, tennis 1.3 km, golf course 1.6 km, Sprotzentrum 500 m, cable car 300 m, ski school 1.5 km children's ski school 1.5 km ski-kindergarten 1.5 km cross-country ski trail 1 km, Please note: free ski bus. Other Activities: Sledding, indoor climbing park, ice skating. Ski: Magnificent ski First Grindelwald or male connecting to Wengen. Die Preise verstehen sich inkl. Bettwäsche, Badetücher, Küchenwäsche und Einstellhallenplatz. ACHTUNG: bis am 18.12.2016 befindet sich eine Baustellte vor unserem Haus und es könnte zu etwas lärm führen. Deshalb haben wir den Preis von 220.00 auf 170.00 Euro pro Nacht gesenkt.